Italy coach Antonio Conte claims he has no regrets about accepting the Chelsea job after Italy put in an outstanding performance against Spain. The Italians eased past Spain with a 2-0 win to set up a quarter-final clash with world champions Germany on Saturday. A repeat performance and win would install Italy as one of the favorites to win Euro 2016, but Conte insisted he has no regrets about his decision to move to the Premier League. 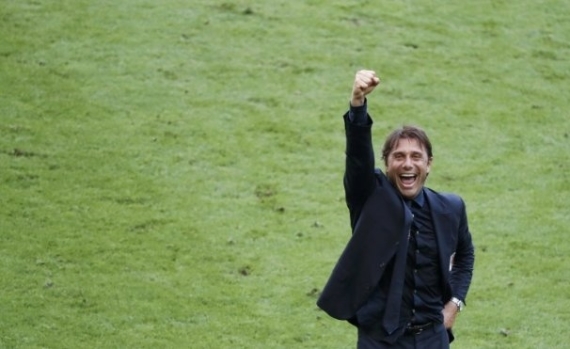 "I've made a choice," Conte said after the Spain game. "I will have a significant experience abroad now." Yet he refused to rule out a return to coach the Azzurri in the future. "Clearly Italy has a place in my heart from every perspective and I hope to be Italy coach again in the future because there is no experience like that in the world," he added. Conte also talked about how he had used a club mindset to get the best out his players. "Right from the outset since I took over I have said that the only route forward to achieve a semblance of success is to try and be a like a club team," he explained. "We can't simply be a group of players. There is no point in hiding it, this is not the rosiest period for Italy in terms of talent. "Given the fact we can't fall back on a selection of good players we have to be a collective. I have battled for two years for people to understand this and we are a team. "We have been working very intensively for a month now, tactically and physically, in a bid to surprise people and we have already succeeded on that."